Sunday! In addition to the New Year’s dip in the ocean, there will be music, refreshments, competitions and more. Not only is this an exciting way to start off the New Year, but also proceeds from the event go towards Communities in Schools of Cape Fear, an organization that supports at risk youth and encourages them to stay in school. Admission is between $10.00 and $25.00. Happy 2017! Come ring in the New Year at the Country Club of Landfall! There are two New Year’s Eve parties this year, one for families and one for adults only. The Family New Year’s Eve Party takes place from 11:00am until 2:00pm in the Landfall Clubhouse Ballroom. There will be a DJ and a breakfast for dinner themed buffet. The adult party has two parts. First, from 6:00pm to 9:00pm is the dinner portion. The dinner has a delicious prix fixe dinner which includes, smoked chestnut bisque, ginger seared ahi tuna, king crab-crusted filet mignon, deconstructed lobster pot pie, pan-seared grouper, chocolate silk pie and more. Then from 9:00pm until 1:00am is the party and dance portion of the event. There will be a DJ, a midnight champagne toast, and live coverage of the ball drop in Times Square New York. Wherever you spend your New Year’s Eve, we hope you have a safe and fun night! Looking for a fun way to see Christmas lights all over scenic Downtown Wilmington? 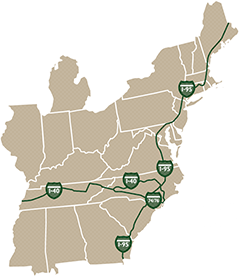 The Wilmington Trolley Company has the perfect tour for you! They offer a Holiday Lights Trolley Tour in December. Tonight and tomorrow night at the last night of the tours, which start at 6:00pm and 7:30pm. The trolleys are heated and include music and narration making it an ideal setting to view holiday lights. The trolley goes all though historic Downtown Wilmington, where guests will enjoy the lights from commercial and residential areas. Tickets are $12.00 for adults and $5.00 for children. For more information visit Wilmington Trolley Company’s website http://wilmingtontrolley.com/tours/. One of the most iconic musical characters is coming to Thalian Hall! Annie Warbucks the sequel to Annie starts showing tomorrow until Sunday. Annie Warbucks starts off where Annie finished, with Child Welfare Services telling Daddy Warbucks that he must marry in sixty days in order for Annie to have a mother. This becomes a much harder task than first thought due a plot to con Daddy Warbucks for his money. Showtimes are 7:30pm Thursday, Friday, and Saturday, and 3:00pm Sunday. For more information on the musical visit Thalian Hall’s website http://www.thalianhall.org. The Country Club of Landfall has something for everyone. Whether you are interested in golf, tennis, the pool, music, food, dances, parties, or classes, The Country Club of Landfall has it for you. Now, in the Holiday Season, there are a lot of events in the next week that you won’t want to miss. First, happening this Tuesday is the Annual Gingerbread House Decorating Class. 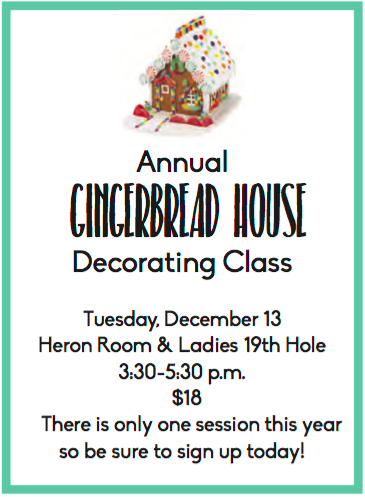 This fun class helps you design the perfect gingerbread house, which will look great on display in your own home. It takes place in the Heron Room and Ladies 19th Hole and lasts from 3:30pm until 5:30pm. Then, on Wednesday there are two events! The Great Oaks Club of Landfall is meeting at 11:30 at the Landfall Clubhouse for their annual Christmas luncheon. Later that day is the Silver Oak Wine Dinner in the Landfall Ballroom at 6:30. This dinner is a great chance to try new wine and savor a dinner that is perfectly paired with it. 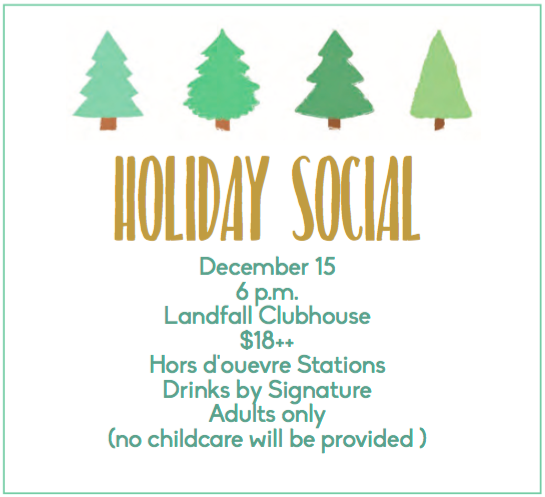 On Thursday, it’s the Holiday Social, which is a fantastic time to catch up with friends and meet new ones while enjoying drinks and hors d’ouerves. The social starts at 6:00pm at the Landfall Clubhouse. Then, on Sunday, it’s one of Landfall’s newest traditions, the extremely popular Christmas Carol Sing. This event now in its second year, is a 30-minute musical program where everyone is encouraged to join in the Christmas Carols. There will be musical accompaniment and song sheets passed out to everyone. The caroling takes place at the Kenan Chapel at 5:00pm, and after everyone is invited back to the Country Club of Landfall for refreshments. Santas, snowmen, reindeer running around the Wrightsville Beach Loop? That’s exactly what is happening Saturday morning at 9:00am. The 7th Annual Jingle Bell 5K Run and Walk is a fundraising event with proceeds benefitting the Wrightsville Beach Museum of History. The Wrightsville Beach Museum educates visitors about the island’s island history and explains what makes the island so unique. 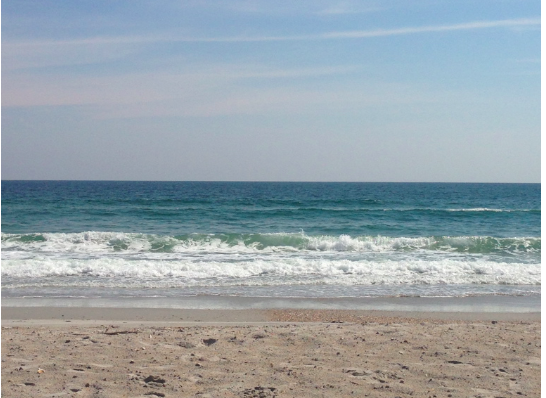 Ranked as a “top 20 Best Surf Town” and one of the “Last Best American Beach Towns” by National Geographic, Wrightsville Beach has a lot to offer. The Jingle Bell Race Fundraiser is one way the Museum is able to have free admission to all guests. The race, which is a 5K run or walk, encourages participants to dress up in holiday costumes, including Santas and snowmen. This Saturday join in the fun and sign up for the race or come cheer on the participants! 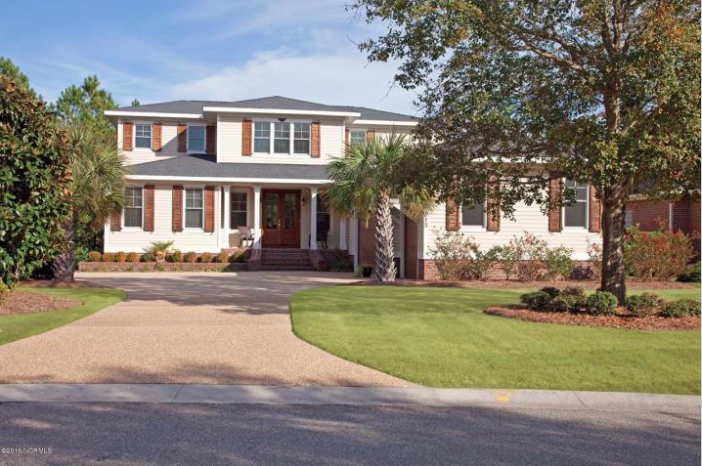 This distinctive one of a kind luxury property is in the prestigious Landfall neighborhood. Built in 2013 it offers a modern floor plan with a three-car garage. Search no further for a custom home without a formal dining room! This home boasts a kitchen and dining room that spans the entire length of the home. 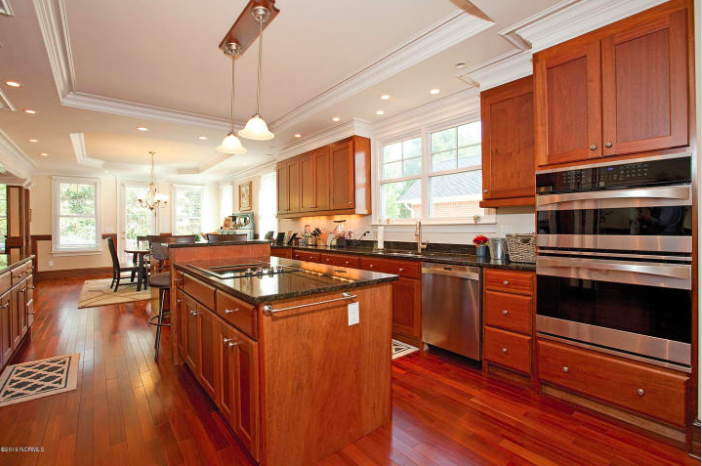 With abounding elbowroom, it offers a prep sink, large island, pantry, and plenty of cabinet storage. A large deck off the back of home, which is nestled among mature trees and timeless landscaping, provides you the ideal sized yard to maintain. Great attention was given to every detail, including custom moldings, Brazilian cherry floors, granite, stainless steel appliances, cypress siding. First floor master, two half baths on first floor, two bedrooms and media room with flex space upstairs. This home will allow you to host the largest of gatherings in your kitchen as well as entertaining new friends and dear loved ones. Enjoy the large bright living room with a wet bar. This floor plan allows conversations to seamlessly flow into any room or onto the deck. A custom fireplace with flat screen TV remains with the home. Ceilings throughout are highlighted with 3-piece crown moldings and decorative beams in living room. The laundry room includes a utility sink and Brazilian cherry stairs. Landfall is located on 4.5 miles on the Intracoastal Waterway and less than 10 minutes to Wrightsville Beach. Enjoy Tennis, Golf, and swimming with a membership to the club.